As a society we tend to burn the candle at both ends, and our bodies often suffer as a result. Whether it’s lack of quality sleep and substantial exercise, or taking the time to fuel our bodies with the proper fresh, balanced nutrition, it’s time we all spend a moment taking stock of our approach to wellness. While it’s hard to stop being busy, making ourselves a priority is crucial. Our good health is our most precious and important possession. One of the ways to stay on top of our health is by packing our own lunches instead of reaching for what’s quick and processed. When we pack our own food for work, we are directly controlling our nutrition, which is ultimately better for our health. But sometimes it’s difficult to figure out what to pack, and we find ourselves eating the same thing over and over. Just like workouts, it’s important to mix things up to give your body the right nourishment and care. Solution? Eat the rainbow! Change up the veggies and fruits that you have on the side, and pack in some protein while you’re at it. Here’s a good choice that is simple to pack and keeps well---we give you our hummus and veggie sandwich. Great for the office or sending with the kids to school, this quick and fresh meal is a delicious and easy way to get plenty of healthy nutrition and protein for your busy day. 2. Spread 2 Tbsp. 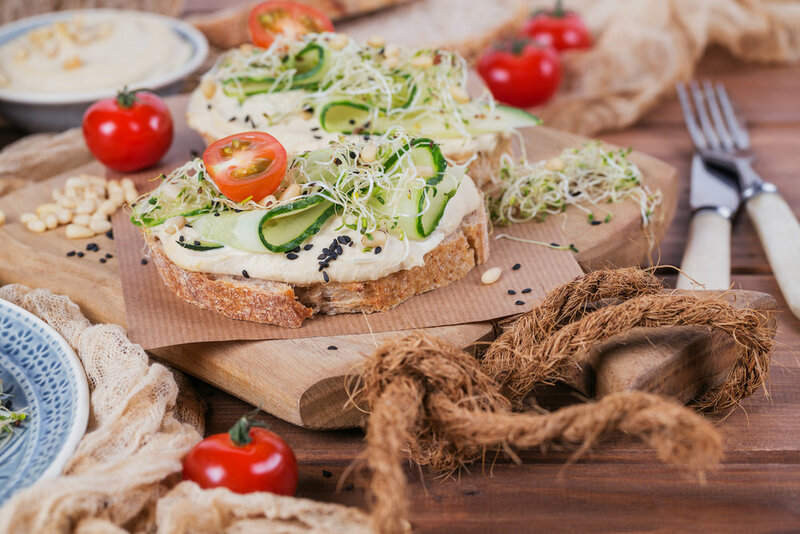 White Bean Hummus on each slice of toast. Divide the avocado, tomato, and red onion, and lettuce evenly between the 4 toasts. 3. To serve, place 2 open-faced sandwich halves and 1 cup baby carrots on each plate. Add all of the ingredients to the base of a food processer. Process until smooth and enjoy! It should keep in the refrigerator for about a week. Looking for more wellness tips? Sign up for our free newsletter. Scroll down to the link below to sign up.